When you run a website, sometimes the delay it takes to get detailed stats from Google Analytics about your visitors just isn’t good enough. Sometimes you need to know exactly what’s popular on your site right now. Hoping to be the perfect tool for the job, the UK’s GoSquared has launched the latest version of its LiveStats product today. 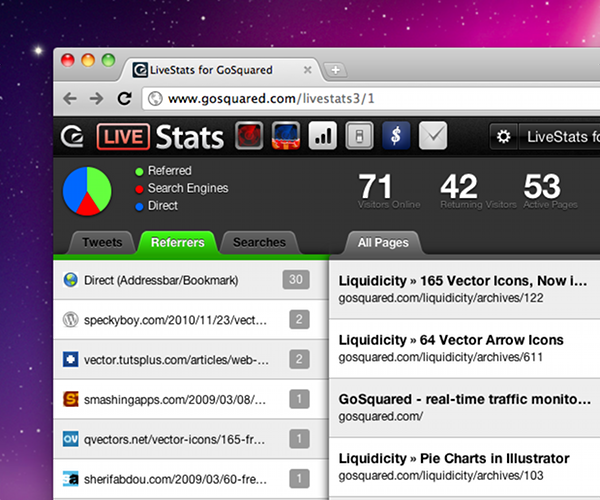 The new site is designed as a one-stop dashboard to tell you exactly what’s popular on your site right now, and why. It’s all packaged beautifully, with lights flashing up on a map as visitors hit your website. It gives LiveStats something of the look of a NASA mission control dashboard and when traffic is busy, it’s quite exciting to watch as information flies onto the screen telling you the essentials about your visitors. Divided into three columns, the page displays sources of traffic on the left-hand side of the screen with tabs to show the latest tweets, websites and searches that are leading people to your site. 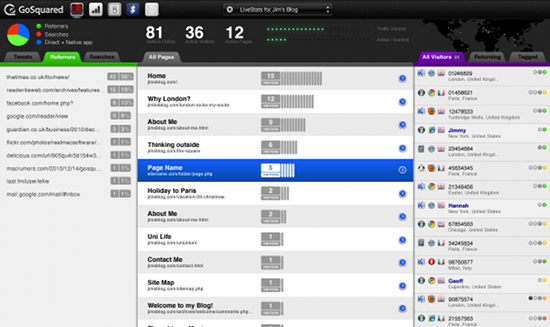 The central column displays a constantly updating list of which pages are most popular at the moment. Meanwhile, the right-hand column digs into detail about who is looking at your site right now, including their IP number, where they are in the world and the browser and OS they’re using. If you know who certain users are, you can even label them so you see them listed by name each time they visit the site. This feature can be set to hook into your website’s user database if it has one, meaning that signed-in users automatically appear by name. Not new, but also part of the package is a widget you can embed on your site, allowing everyone to see just how popular (or unpopular) your site is right now. LiveStats isn’t the only company offering real-time stats. 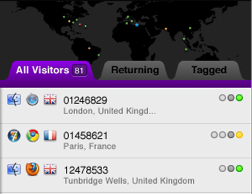 For example, Clicky‘s stats package offers a ‘Spy’ mode which gives a glimpse at current visitors to your site. However, LiveStats offers much more at-a-glance information from one screen. “Services like Clicky make use of real-time data in an interface that was intended to show historical data,” explains London-based GoSquared’s James Gill. “LiveStats, on the other hand, is designed from the ground up to make use of real-time data and instantly give you a summary of the current status of your site.” This distinction make LiveStats a worthwhile accompaniment to deep analytics products like Google’s. LiveStats is available as a free plan that tracks up to 10,000 pageviews per month. All other plans are charged monthly at prices starting from $9.99 , and GoSquared can work out custom plans for larger customers. More information on plans is here.